Step 1: Visit GoHealthyNext.com. We recommend using browser Google Chrome, Dragon, or Firefox rather than Internet Explorer. Go to the Hair Analysis tab and select Forms. 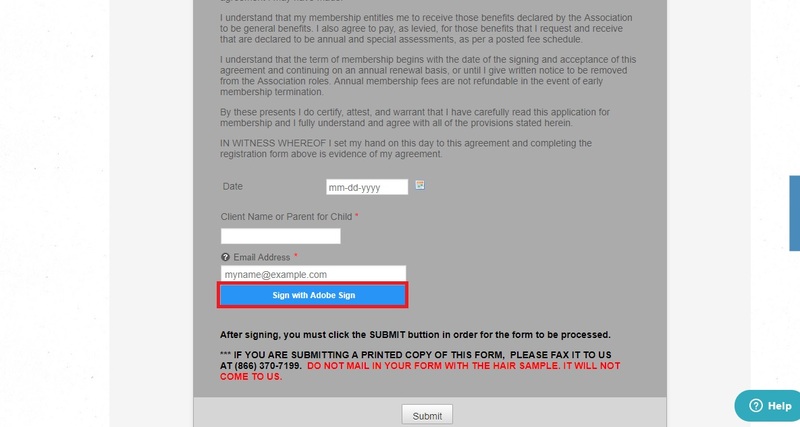 Step 2: Scroll down to select the Membership Form. Step 3: Click each box to fill in the necessary information. All boxes marked with a red asterisk are required and the form will not submit without them filled in. Step 4: Click the Verify Email button after inputting email in order to get a Confirmation Code. Step 5: Put the code emailed to you in the empty box and press Confirm Code. Step 6: When all information has been filled in, click the blue Sign with Adobe eSign button. Step 7: Wait while the signature processes. Step 8: Click the Signature box in order to fill it in. Step 9: Type name in to sign and click the blue Apply button. Step 10: Scroll down to click the Click to Sign button. You will receive the below message. Step 11: In order to successfully send us a copy, click Close Window to return to the form. Then click the Submit button. Your form is now submitted.